At the top of the escalator at the airport, you can find Leisure Suite Larry. Talk to him him to hear the Leisure Suite Larry tune. Talk to him some more for some funny lines. Look through the knothole of the wooden fence next to the Quickie Mart to get a Police Quest reference. In the game's resource file, there is a reference to Jim Walls and Police Quest 2 in text040, which refers to the jungle maze on the island after Larry escapes the cruise ship. 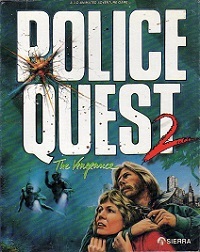 The text reads: "You discover Jim Walls testing Police Quest II. Jim! You were supposed to be on vacation." Unfortunately we have not yet been able to trigger this Easter Egg. If you know the command that triggers it, please let us know!